The Lausanne Congress on World Evangelization is taking place in Cape Town, South Africa October 16 — 25. More than 4,000 participants have come from almost 200 countries. Flyn Ritchie, president of Christian Info Society (which publishes this website), is currently there; he sent the following report October 21. 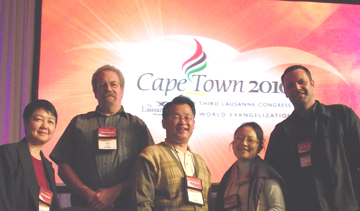 Flyn Ritchie (second from left) with his table group at the Lausanne Congress on World Evangelization in Cape Town. When I landed in Cape Town the other day, I completed a round trip (of sorts) in my journey as a Christian believer. I am back on African soil for the first time since I was saved, while traveling through Zambia, in 1977. I’ve had the opportunity to reflect on my own pilgrimage; but I’ve also developed a renewed appreciation of the simple words and acts, carried out by so many anonymous — and sometimes well recognized — people all over the world. It is that proclamation of the gospel, accompanied by caring deeds, which led to the dramatic growth of the church in the global south (not least in Africa) over the past century. And that’s what the Lausanne Congress on World Evangelization is building on in Cape Town. Thirty-three years ago, at 25 years of age, I hitch-hiked into Cape Town, on the southern tip of the African continent, after covering the 2,000-plus kilometres from a farm outside Lusaka, Zambia. I arrived at the farm with some blend of New Age and Marxist beliefs, but became a Christian through the influence of the farmers with whom I stayed and worked for three months — and under the prompting of an Australian evangelist preaching in a local Baptist church. Instead of carrying on my long trip to New Zealand, I set my course to back to Europe, to L’Abri, a Christian community in Switzerland, which my Zambian hosts thought would suit a young man of many questions. Some of my questions were answered there; but I also met my wife Margaret, and we moved back to Vancouver. Thirty-three years later (missing my wife, five children, daughter-in- law and granddaughter) I am back in Africa, in a reflective mood. Some 5,000 people crowd the halls and assembly rooms at the Lausanne Congress for World Evangelization — including participants, volunteers and others, from just under 200 nations. They reflect the incredible diversity of the church today. The underlying purpose of the event is to “see Christ’s final command on earth fulfilled — to make disciples of all nations.” From this vantage point, the goal seems within reach. Every day, I meet people who make it abundantly clear why the gospel continues to spread — why Christianity is both the largest and fastest growing faith on earth. Let me take just a few examples from Africa. Ntsiuoa, a doctor from Lesotho, works in an AIDS clinic. Asheber, from Ethiopia, says thousands of Muslims are coming to Christ; he and his flock are busier discipling than evangelizing. Sarah, a Ugandan who runs an electricity transmission company, spends the rest of her time working with widows. Not all stories at Lausanne suggest victory. At my table group of six people — we meet twice every day — we hear from Hikari that in Japan the number of Christians remains stalled at below one percent; from Paul that many young Koreans no longer buy the ‘soul winning’ approach to the gospel, and are dropping out of church; from Matt that New Zealanders are comfortable and apathetic about the gospel message. But the key is that they — and multitudes more like them — carry on in their work, spreading the message of the gospel, person by person. Well, that hasn’t really described me over the years. I’ve always believed in it, of course, and when people asked, I’ve always told them I was “saved in Zambia” — rather than that I became a Christian, or something less in-your-face. Because I was saved — from a life separated from God. I didn’t find God in Zambia, he found me. But I was helped on my way by regular people, some of whom turned out to be more flawed than I could see at the time. At Lausanne, we have heard many heroic and impressive stories. There are giants among us, and most are leaders in one way or another. But the majority of the participants are still regular folks, representing thousands of other regular folks. And it is the eternal significance of their stories that remains with me in my hotel room tonight as I mull over my return to Africa.